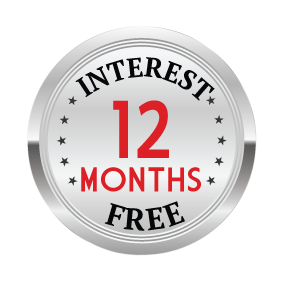 12 day Greek Island Hopping Adventure tour including return international Emirates flights, breakfast daily, convenient transportation by ferry, in-depth sightseeing and more. 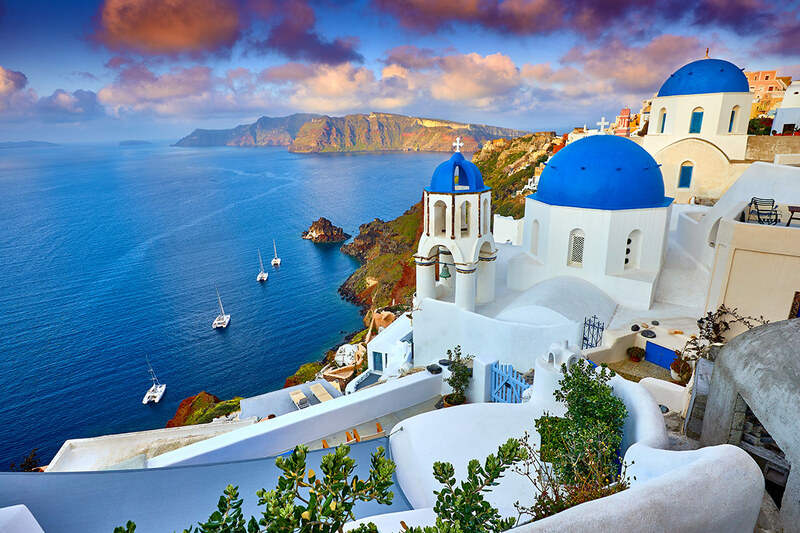 Experience the magic of Greece with a 12 day Greek Island Hopping Adventure. 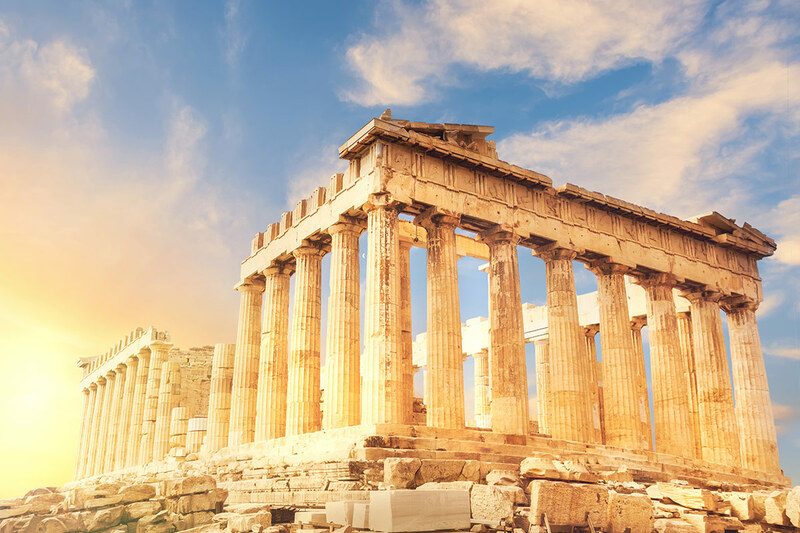 Explore the capital of Athens and visit some of this city’s most famous sights including the Acropolis, the Temple of Zeus and the Houses of Parliament. 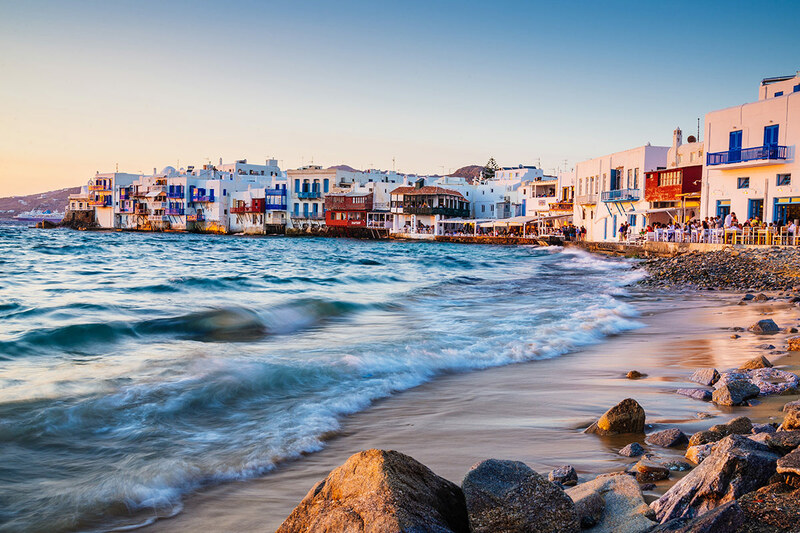 Board your ferry at Piraeus port and set off for the gorgeous island of Mykonos. Admire the view of the island of Delos from the beautiful beach of Agios Ioannis, before making your way to Mykonos’ second largest town, Ano Mera. A much quieter town compared to the first, gain an insight into the simpler and more traditional life of the locals. See one of the best examples of post medieval Cycladic towns, when you arrive in the capital Chora. 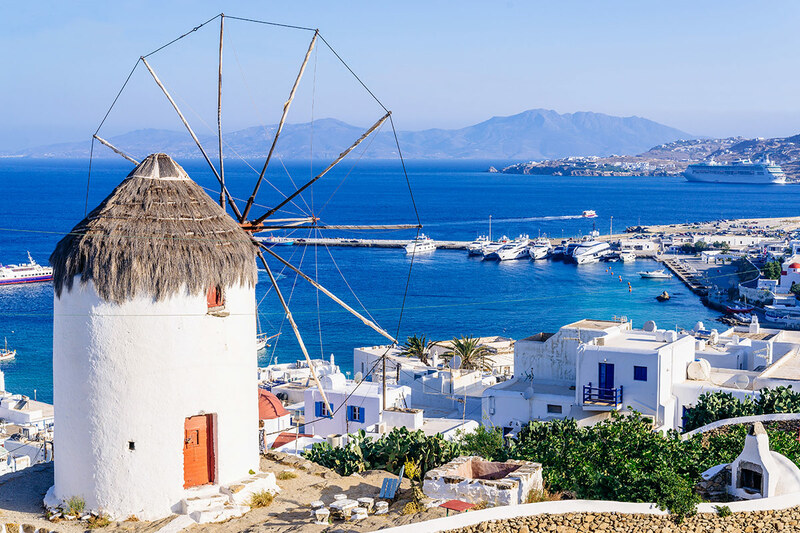 Navigate the narrow cobble stoned streets towards the famous wind-mills and Little Venice landmarks, where you will have an incredible view of the magical Greek sunset. Continue your adventure in the beautiful island of Santorini. Visit the famous volcanic Red Beach, discover the so-called “Lost Atlantis” and relax on the popular Perissa Beach. Taste your way through one of the oldest vineyards in Europe, before taking in the striking panoramic view of the entire island from the village of Oia. 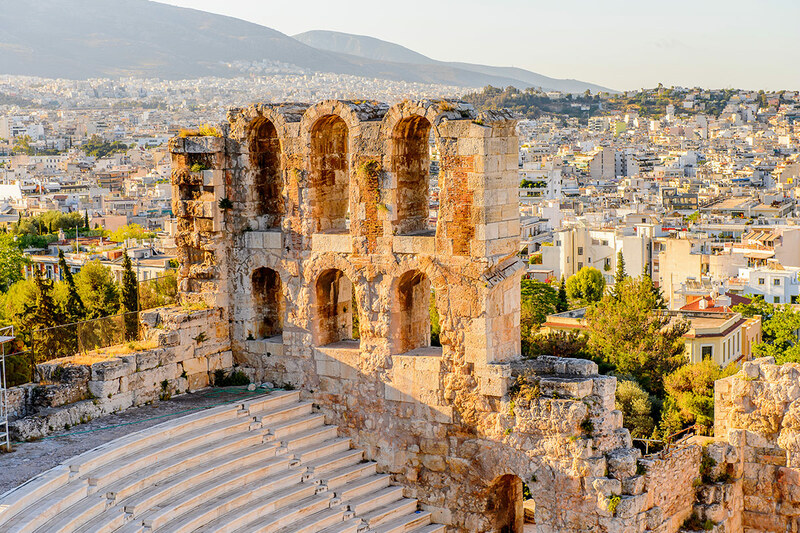 Finish your journey back in ancient Athens, before beginning your trip home. 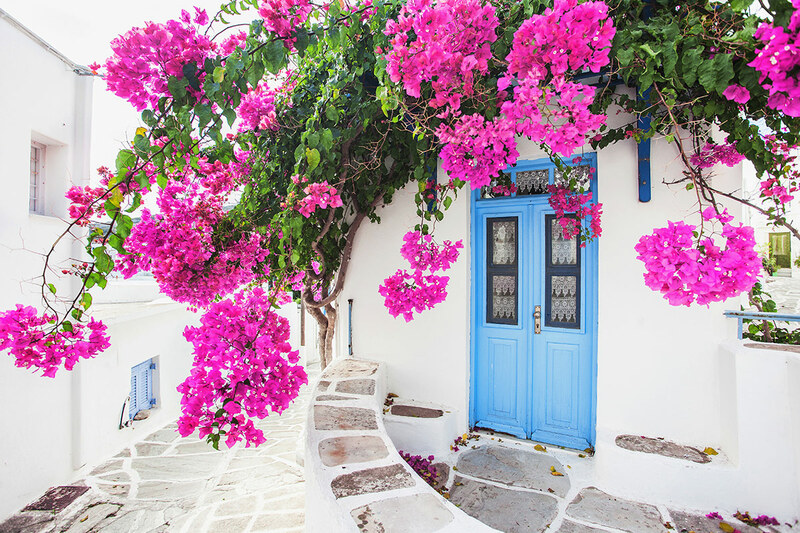 Depart Australia today to begin your incredible Greece holiday. Welcome to Greece! Arrive at Athens International Airport and make your own way to your hotel. You are then at leisure to enjoy this historic city and relax after your flight. Best Western Candia Hotel welcomes you in the heart of the Greek capital and the famous historical center of Athens. The town is globally admired for her rich historical and cultural heritage whereas the location of Best Western Candia Hotel is more than ideal to navigate and explore. High standard amenities and renovated facilities of European specifications are combined with friendly prices and form the ideal hosting environment for visitors. The view from the roof garden and terrace in the illuminated Acropolis and the Lycabettus hill is fascinating. Enjoy your stay! 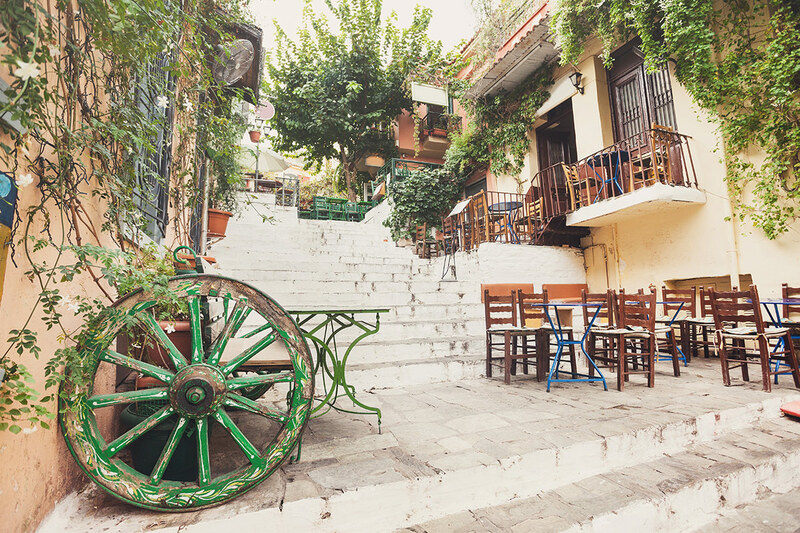 After breakfast, explore Athens onboard a Hop-on Hop-off bus. Commencing at Syntagma Square you’ll trace the history and culture of Athens from ancient times to the present day, whilst being able to visit all the main sights such as the Acropolis, Temple of Zeus and the Houses of Parliament. Make your way to Piraeus port for your ferry to Mykonos. Relax as the ferry takes you through the Greek archipelago to the Cyclades. Make your own way to the hotel and spend the rest of the day at your leisure. Olia is an excellent choice for a comfortable stay, exceptional service and a laissez-faire ambience. The hotel built with great passion, in typical mykonian architecture and traditional colours, featuring breathtaking views of Aegean Sea at sunset time from the swimming pool. This morning, explore Mykonos on a guided tour. The tour starts off with a photo stop at the beautiful beach of Agios Ioannis on the west coast of Mykonos. From there you will have the opportunity to admire the view of the island of Delos, as well as the two chapels dedicated to Saint John. See the luxurious villas built in typical Cycladic architecture in one of the island’s most elite neighbourhoods. The tour continues with a short drive that brings you to Ano Mera, the second largest town of Mykonos. 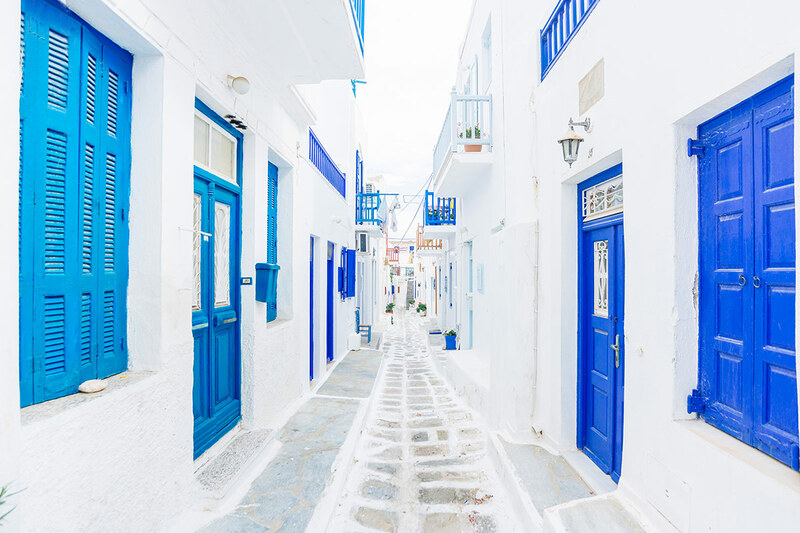 Located in the centre of the island, the quiet and traditional life of Ano Mera comes in complete contrast with the bustling rhythm of Mykonos town. Here you will visit the Monastery of Panagia Tourliani, built in the 16th century. En route to Mykonos town, you will have a short photo stop at Kalafatis beach. Mykonos town, the capital of the island, also known as Chora, is one of the best examples of post medieval Cycladic towns. Here you will explore the narrow cobblestone streets which bring you to the famous wind-mills and Little Venice landmarks. Arguably the best place to watch the sunset in Mykonos. Visit the complex of Paraportiani church, one of the oldest churches of the Island. If you are lucky you will encounter Petros, the famous pelican of Mykonos, and learn about his fascinating story! Enjoy Mykonos on your own today. Make your way to the port for the ferry to Santorini. Relax as the ferry takes you past Paros, Naxos and Ios toward Santorini. Make your own way to the hotel and spend the rest of the day at your leisure. Set right on the black volcanic beach of Kamari village, Kamari Beach Hotel stands out not only because of its excellent location but also because of its 50 years of tradition in providing excellent, value-for-money hospitality. Designed in the 70’s and continually updated, Kamari Beach Hotel is an iconic example of Aegean all-time classic architecture. It is the ideal shelter for your uninterrupted relaxation in Santorini. Today enjoy a full-day guided tour of Santorini Island. Start your journey with a short photo stop at the famous volcanic Red beach, well known for the unique colour of the sand, its soaring red lava cliffs and clear green waters. Move on to Akrotir, and explore the so -called “Prehistoric Pompei” or “Lost Atlantis”, one of the most important Minoan Bronze Age settlements of Greece, buried and preserved by the volcanic ash of one of the largest volcanic eruptions in human history (17th century BC). Enjoy free time to have lunch and relax at Perissa Beach, one of the longest black sandy beaches in the Cyclades and the most popular beach of Santorini. After lunch, explore one of the oldest and most authentic traditional villages of Santorini, built like a small labyrinth, and visit its medieval fortress (15th century). Taste Santorini’s distinctive wines and learn about one of the oldest vineyards in Europe while admiring the spectacular view of the volcano. 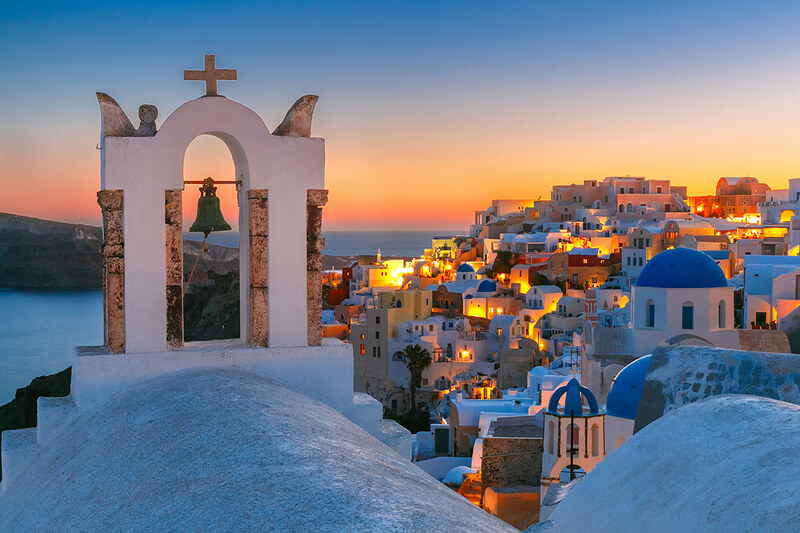 Finish your tour with a short stop at Profitis Ilias – the highest peak of Santorini (567 meters) to admire the striking panoramic view of the entire island with free time to enjoy the sunset in the village of Oia. Enjoy Santorini on your own today. Make your way to the port and let the ferry take you back to the mainland of Athens. Make your own way to the hotel and spend the rest of the day at your leisure. Bid farewell to Greece and make your own way to the airport today.